The Gore Range, from across the Blue River valley. I found myself with several days off and a restless feeling. After all, it was the Vernal Equinox. Spring. Very early spring, but it’s got to start somewhere. So rather than sit at home or photograph locally, I decided to commence on a road trip around northwest Colorado. Eventually I reached Grand County and Summit County, where I long ago worked as a forester. Before I got to Silverthorne, I took a brief side trip to some overlooks that few people know about. They look across the Blue River valley to the Gore Range, one of the most spectacular ranges in the Rockies. I’d done several backpacking trips up into them, the Eagles Nest Wilderness, so long ago. The late afternoon light, breaking up after a snowstorm, was intense. Extreme contrast. I did manage to eke out a couple of splendid panoramas. The Blue River Valley, north of Silverthorne, Colorado. Then it was down into town: Silverthorne, Dillon, and Frisco. I knew it would have been much more built up, being in Colorado Ski Country. And traffic was bad. The red lights seemed to take forever, each. It’s a beautiful area, but I probably won’t return. I live in a much more laid back area of the state these days, and being back in ski country only made me appreciate how much better I like where I am. Almost home: San Juan Mountains, south of Ridgway, Colorado. Photo location: Blue River Valley, Summit County, Colorado. Mesa Verde North Rim from the Geologic Overlook. As I continued my way on the “outbound lane” as the Rangers call it in Mesa Verde (there’s only one road in, and out), I paused at the Geologic Overlook. The monsoon showers were gracing someone’s location to the north. Where I was it was soft overcast light and summertime greenery. Partial rainbow at Park Point, Mesa Verde. At the turnoff for Park Point, those rain showers to the north provided a partial rainbow, with the La Plata (“Silver”) mountains serving as a backdrop. The North Rim of Mesa Verde, looking north from Park Point. At Park Point is the fire lookout “tower”, which has no legs. Because it needs none, the perfect 360-degree view being provided by its elevation above the surrounding landscape. While walking by I became interested in my reflection through the glass onto mylar or whatever sun shading film they had cutting the intensity of the afternoon sun. Then down the curves to the Montezuma Valley Overlook and the best example of The Knife Edge cliff formation (of Point Lookout Sandstone) visible from the road. Mesa Verde road above the Montezuma Valley Overlook and the Knife Edge. From there it was down into the head of Morefield Canyon, where the park’s campground is located. I stopped for a stroll on the easy–but impressive–Knife Edge Trail. It follows part of one of the original roads into the park. And believe me, be glad for the modern road we enjoy today! Knife Edge Trail, on the grade of the old Knife Edge Road into Mesa Verde National Park. After returning to my vehicle, there was just one more set of switchback curves before rejoining the Montezuma Valley and exiting the park. And on those curves is one last viewpoint: overlooking the Mancos Valley. And it was raining down there, and the lush green irrigated fields looked gorgeous. The Mancos Valley Overlook and July thunderstorm, from Mesa Verde. Rabbitbrush (Chrysothammus spp.) at Cliff Palace parking lot. A sure sign that late summer has begun across the southern Colorado Plateau is the flowering of Rabbitbrush. Especially when you have a butterfly seemingly pose for you in the sunlight. From Cliff Palace it was on across the rest of the northern edge of Mesa Verde. I hadn’t visited Cedar Tree Tower in a while. Time to fix that. Cedar Tree Tower site, Mesa Verde. The concept of building small towers out of adobe at Mesa Verde (and elsewhere in the region) is fascinating to think about. For what purpose? You don’t do anything this labor intensive just for fun. At Cedar Tree Tower, there is also the stabilized foundation of a kiva, a subterranean circular room used for ceremonial purposes, as well as other activities. Most interestingly at this site, there is a small tunnel between the two. So the tower had no outside doorway. You got into the tower via the kiva, or not at all. Burned stump of the “cedar” tree that gave Cedar Tree Tower its name. This year’s Indian Ricegrass at its base. The area around Cedar Tree Tower was burned by the immense Chapin 5 Fire in 1996. Thus the “Cedar” tree that gives it its name — actually a Utah Juniper — was burned to the ground. Broadleaf (Banana) Yucca at Cedar Tree Tower. As usual I paused to examine some fine examples of Broadleaf ( or Banana) Yucca (Yucca baccata). At this time of year their fat green seed pods must look like watermelons to the wildlife. Ripe seed pods of Broadleaf (Banana) Yucca. The yucca’s green, long, needle tipped “leaves” have curly white fibers that are fascinating to a photographer. At least to this one. Leaf fibers of Broadleaf (Banana) Yucca. Oak Tree House environs, Mesa Verde. On the Mesa Top Loop road, the early evening was continuing to play out so beautifully. At the Oak Tree House cliff dwelling overlook, I started with a wide shot to capture both the location and the incredible skies above. Oak Tree House closeup. You can only take a backcountry Ranger-led tour to it. Then it was on to Sun Temple. A location that is most notable for me in that it has an excellent view of Cliff Palace from across the canyon. Sun Temple pueblo site, Mesa Verde. But first I felt the desire to give Sun Temple some more attention. It’s not that easy to do, photographically, because it’s the ground floor of a big mesa top pueblo, and there is no overlook from above for visitors. So you are left with reading the interpretive sign and…imagining all that went on there with those peoples’ lives way back then. Cliff Palace locale, from Sun Temple. At the far end of the Sun Temple parking lot is the Cliff Palace View lookout point. This is where the pro photographers make the panoramic-wide postcard and poster shots you can buy in the gift stores. Um, the only problem I have with most of the Cliff Palace pro photos is that they zoom in too much on the cliff dwelling itself. Understandably so, because it’s amazing, mesmerizing, being the largest cliff dwelling in North America. So I made sure to make some wider shots, of the environs. Especially with such beautiful skies trying to distract me upward. Cliff Palace on a late July afternoon, from Sun Temple. I drove over to the Cliff Palace parking lot. Where you go when you hold a ticket for a Ranger-led tour down to the site. Which these days is the only way you’re allowed to go down there. Appropriately so; too many people want to see it to let them go wild on their own. The Park Rangers have to give you the best interpretive experience while protecting these precious sites. Such a balancing act. They manage to do it quite impressively. Cliff Palace is the most famous site in the park, so it’s also the most crowded. But–and maybe I shouldn’t say this–still very laid-back compared to the biggest of our National Parks. Yes, and here in the middle of summer. A wonderful place to be. Cliff Palace and sky, July afternoon. But the setting is at least as important as what the ancient ones somehow came to build there. And on this July afternoon, it could not have looked any better. Summer thunderstorm evening at Montezuma Valley Overlook. The Southwest’s thunderstorm monsoon season continues in full swing. Clear blue sky mornings, with thunderhead clouds building toward mid-day. Then in late afternoon, ka-boom! Or not. Depending on which spot you happen to be located at the moment. Besides giving the land some much appreciated rain, it gives photographers much desired dramatic lighting. Farmers and ranchers harvest crops and livestock, I harvest photographs. So recently I was driving down off of Mesa Verde at mid evening. There had been a heavy thunderstorm at the north end of the park, but it had moved on by the time I got there. I pulled over at the Montezuma Valley Overlook for a nice shot showing the summertime greenery, the Knife Edge cliff formation, and the stormy skies. Then it was down off of “the hill” as the park rangers call it. (A recent visitor said: “You call that a hill? I call it a mountain!”). Evening light on the folds of the North Rim of Mesa Verde. Whatever you call it, I was back down into the Montezuma Valley just east of Cortez. As the sun got lower it partially broke through the clouds to light up the tall rugged escarpment (geology talk for “really big cliff”) that is the North Rim of Mesa Verde. Sunset time at Totten Reservoir. I pulled in at Totten Reservoir, because it is public land and has a great view of Mesa Verde, Sleeping Ute Mountain, and sunset. Quite the package. Sleeping Ute Mountain from Totten Reservoir. Photo location: Mesa Verde National Park and Montezuma Valley, near Cortez, Colorado. Sunbeams over the Abajo Mountains, just east of Monticello. Driving west from Colorado into Utah on highway 491, I was watching a small storm front approach from the west. Snow showers swirling around the Abajo Mountains, which are often called “the Blues” by the locals in Monticello, Utah. Almost sunset. The sun too high for colors, but it streamed through the shifting clouds in dazzling fashion. I had to pull over to the side of the highway to get a shot. It’s what I do, after all. Photo location: Highway 491, San Juan County, southeast Utah. Waldens Lake on Christmas Eve afternoon. A deep freeze earlier in the week had left my local trout fishing lake frozen along the entire shoreline. No fishing. Was the season finally over for me? Then we got another snow storm, but with it came some warmer weather and stiff breezes to make wave action on the lake, which works on the edges of the ice to at least break up some of it. Today I saw that the south end of the dam was open to the shoreline. So home I went to get my fishing gear. I caught six trout, keeping four. Tonight a Christmas Eve storm is due in with another two to four inches of snow. Guaranteed White Christmas. Christmas Eve Rainbow Trout catch. December sunset afterglow backlights a cloud bank over the Abajos. Another chilly early December evening. Fishing was good at the lake, a nice chop to the water but not so strong as to make conditions unsavory. From atop the dam I made overlapping images to merge into a huge panorama file later using Adobe Lightroom CC. Then, looking over my shoulder was the nearly full moon rising above the Earth’s shadow and the Venus Belt. Rising moon, two days before Full Moon. Photo location: Monticello, San Juan County, southeast Utah. Snow squall over the lake seems to be swallowing the late afternoon sun. A cold, blustery afternoon in late November. Sunlight and snow flurries. Not bad. Lake fishing for trout is much better when there are ripples or even small chops on the water’s surface. When it’s calm the water is glassy and the fish can see the line and they think: “That doesn’t look natural. I don’t think I’ll eat it.” They do. They may have tiny brains, but they know what they’re doing. Snow showers around the Abajo Mountains. But the fishing action was slow on this wintry afternoon. The limit for trout in Utah is four fish (you can catch more as long as you release them immediately), and it was taking me a long time to reach my limit. I probably wouldn’t have stuck it out for more than about an hour if it weren’t for the snow showers over the Abajos and the lake. The light was constantly changing as the clouds shifted around. Late afternoon sun reflection and snow showers. The snow squalls would wreathe the mountain peaks, then dissipate for a bit. The wind was coming across the dam behind me, making for a sheltered spot where I was fishing. The calm water at my feet made for a wonderful mirror for the dramatic display in the sky to the south. I would cast my lure over and over, and when another intriguing photo presented itself I set down my rod and reel and got the camera out of the camera bag. I would shoot the scene, then go right back to fishing. Blue and white clouds, blue and white lake. Finally, after two and a half hours in the cold, I had my limit of trout. And the light display was winding down, too. There would be no gold and red sunset colors this evening; the clouds on the western horizon had cut off any chance of that. But the light show of whites to blues to dark blues had been quite mesmerizing. 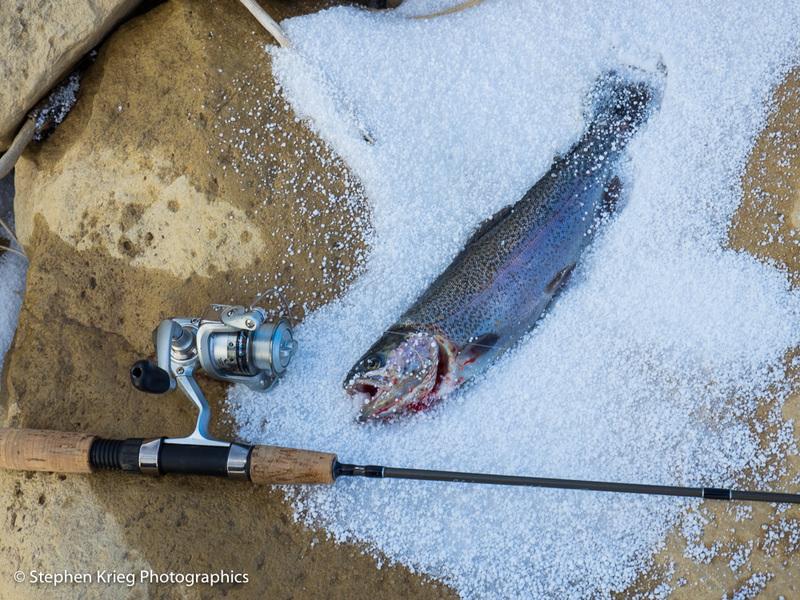 Rainbow trout on a snow patch, new snowflakes decorating it while I continued to fish.